Are you able to "switch off" when you leave the office? "Have you cleaned your teeth? Have you finished your breakfast? Have you got your school shoes on?" Does this sound familiar to you? Well between the 15th and 19th of May 2017, our family will be swapping their school shoes for their trainers as we join in with Walk to School Week 2017. It’s a known fact that walking to school makes children feel happier and healthier but also reduces congestion and pollution outside of the school gates and in general. Childhood obesity is rising fast and children need at least 1 hour of physical activity a day, so walking to school is a fantastic way to get some of that exercise. Children who are physically active on the way to school burn off some of their excess energy, meaning that they are able to settle down and focus well in lessons. It benefits the people who walk with the children to school as they also get fit from the exercise and once you know how long the walk will take you, your journey to school will be much less stressful than being at the mercy of traffic. You might find that walking to school actually saves you time and money as the amount you spend on fuel will also go down! There are many additional benefits to be had when walking through green spaces such as parks, for instance it can help you feel happier and calmer. Unfortunately though, we don’t all have the advantage of finding a route to school that is quiet or traffic free and whilst there is no doubt that walking to school carries many benefits, there are still some scary statistics in that around 5,000 children under the age of 16 die or are seriously injured on Britain’s roads each year and nearly two in three road accidents happen when children are walking or playing near the roadside. Parents therefore often have real concerns about the safety of their children on the walk to school, especially when crossing roads. Fortunately though, there is now a much greater awareness of the need to make walking to school both easier and safer and many initiatives have been tried and tested, such as the use of walking buses meaning that your child can walk to school with other trusted parents. 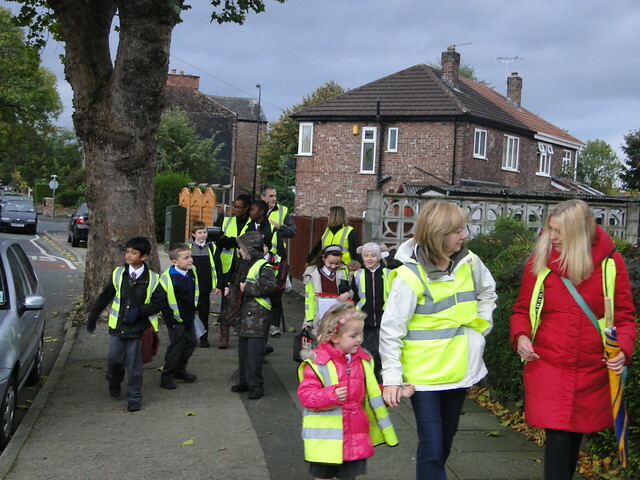 Schools also provide road safety training and children are made aware of safe routes to school. Other initiatives include "park and stride" and the use of hi-visibility clothing. Children need assistance dealing with the traffic environment until at least the age of 10 as they are not equipped physically or developmentally to make the crucial decisions to keep them safe. Teaching them road safety to allow them to walk to school and reap the various benefits of doing so will though stand them in good stead for the rest of their lives. Like learning to drive a car, children need practice and experience to walk in the traffic environment. • Tend to act inconsistently in and around traffic. Overall, Britain has one of the best road safety records in the world and the number of child casualties has declined over the years and we can all play our part in developing a child’s road safety knowledge and skills. Less than half of primary school children currently walk to school so why not join us at Spencers and our families as well as thousands of others across the country celebrating the benefits walking to school can bring. We at Spencers have worked with a number of local schools to promote road safety through age appropriate presentations and quizzes and will be repeating our education programmes this year too so if you know of a school who might benefit, please contact us.